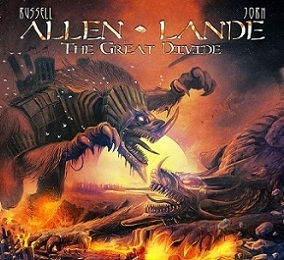 Many fans were worried when they learned that the well-reputed project bearing the names of Russell Allen and Jorn Lande would see an important line-up change four years after the third and last release. Previous songwriter, bassist, guitarist, and keyboard player Magnus Karlsson was, in fact, replaced by none other than Timo Tolkki, one of the most iconic but also most inconsistent musicians of the European power metal scene. Since Timo Tolkki has left Stratovarius, he’s released a whole lot of controversial and (largely) negatively received releases under his own solo banner, during the Revolution Renaissance era, as his short-lived Symfonia project, as mastermind of Timo Tolkki’s Avalon, and recently as bassist in progressive all-star act Ring Of Fire. I have always followed Tolkki’s career with much interest because he wrote not only some of the worst disasterpieces of his genre (Angels Of The Apocalypse and Elements, Part I) but also some of the very best (Dreamspace and Visions). I’m relieved to say that the new Allen/Lande release The Great Divide is what I consider to be one of Timo Tolkki’s very best releases. It beats the solid The Land of New Hope as well as In Paradisum, and may be Tolkki’s best album since Stratovarius’ Infinite. In addition, this release is also a career highlight for both vocalists, especially Jorn Lande, who has largely released exchangeable quantity over convincing quality material over the past few years. The Great Divide is a surprisingly calm album, and almost all tracks here are mid-tempo at best. Another surprise is that Timo Tolkki didn’t include any of his fast-paced signature guitar solis that remind me of gobbling turkeys. His soloing is slower, more relaxed, and less neoclassical than usual, which also describes the overall atmosphere of the album. The instrumental section plays in a soft but precise way, and is very helpful to the overall atmosphere. The guitar work varies from simple melodic lines to beautiful mid-tempo soli. The keyboard is probably the most outstanding instrument on the album, however. It’s always present and still not overused, and the record always comes around with dreamy orchestrations or melancholic piano melodies at the right moments. Massive background vocals and powerful choruses in almost all songs make both singers stand out. Sometimes it’s still hard to decipher the two singers for me, but their performances are generally more distinctive than in the past, and they perform very well apart from this. The catchiest power metal songs here are, first of all, the melodic and powerful opener “Come And Dream With Me” that delivers some amazing guitar melodies that will be stuck in your mind for a very long time from first contact on. “Dream About Tomorrow” is the only up-tempo track with heavier riffs, and also features an incredible vocal performance by Jorn Lande that sends shivers down my spine. The song is completed with sophisticated organ sounds and a liberating guitar solo. It’s definitely among the very best genre tracks released this year (in my opinion). Many songs on the album like “Hymn To The Fallen” and “Reaching For The Stars” have a melodic AOR touch. They really breathe the spirit of laid-back hard rock music of the eighties from bands like Dokken, Journey, or Whitesnake. Even the infamous “Stronger Than Ever” release by Digger (which I happen to like a lot) comes to my mind when I listen to this album. One of the best songs here is the title track “The Great Divide”. Despite being the slowest song on an already rather slow-paced release, this track fascinates with the mixture of soothing vocals from both singers, and inspired guitar melodies. It’s probably the most unique song ever released by the project, but this is still music with force and soul. Fans of Russell Allen, Jorn Lande, and Timo Tolkki themselves need this release. Those who love melodic heavy metal should also give this album a few spins and let it grow before judging it too quickly. If you like AOR or eighties rock, you might enjoy this release more. In a weird way, this album features several trademarks from the former bands of the involved musicians and still sounds different from any other genre release this year due to its newly sophisticated and intellectual approach. For me, the combination of Allen, Lande, and Tolkki works extremely well, and I don’t miss Magnus Karlsson’s input at all.